CNY @Pavillion. The photo borders are set by the camera's built in frame. But I feel the photo looks a little nicer (or worse?) :D Pavillion's theme for this year - Blossom in pink, prosper in red. It's so apt for this festive season. 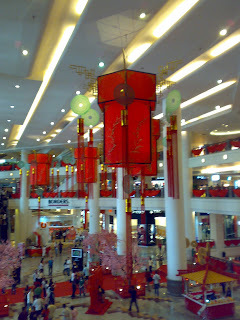 Decoration @ Times Square is the best CNY decoration for this year. Photo gets quite shaky since I try to snap it while going down the escalator. This is apparently not CNY decoration. ;-) But it just looks so nice for me. I doesn't have the chance to watch the dragon dance this year. Anyway, hope it's not too late to wish Gong Xi Fa Cai! Happy NIU（牛） year!